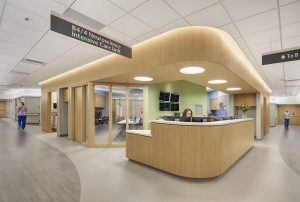 HGA and UW Health have won an Evidence-Based Design (EBD) Touchstone Award Silver Level for the B4/4 Neuroscience Intensive Care Unit renovation at University Hospital in Madison, Wisconsin. The 13,000 square-foot B4/4 inpatient unit serves as a prototype for future inpatient unit design across the multi-campus healthcare system. The prototype goals responds to a variety of patient and staff needs, supports caregiver collaboration, and streamlines operational efficiencies. As follow-up to the planning process and Intensive Care Unit opening in early 2018, the design team plans to conduct a post-occupancy evaluation (POE) using similar research and Lean tools to compare with pre-occupancy, baseline metrics, and pre-design predicted measures. 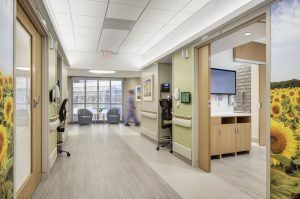 Sponsored by The Center for Health Design, The Evidence-Based Design Touchstone Awards recognize evidence-based design process to increase value for patients, families, staff, and healthcare organizations; improve outcomes; and engage all stakeholders in a healthcare design project. HGA previously won an Evidence-Based Design Touchstone Award Silver Level for a medical-surgical unit renovation at Froedtert Hospital. UW Health is the integrated health system of the University of Wisconsin-Madison, serving more than 600,000 patients annually at six hospitals and more than 80 outpatient sites.